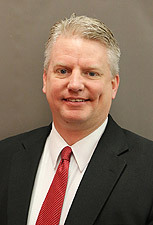 REDDING, Calif. - Simpson University is pleased to announce the hiring of Tom Galbraith as director of athletics. He will begin duties July 1. Galbraith currently serves as the assistant director of athletics for communications at Radford University in Virginia and has worked as an assistant commissioner with the Southwestern Athletic Conference at the NCAA (National Collegiate Athletic Association) Division I level. He also served as an assistant athletics director at Alabama A&M University, among other colleges. He brings more than 20 years experience in college sports administration, including roles as a head coach, sports administrator, sports information director, communications director, and classroom instructor. Galbraith earned a bachelor’s degree in communication studies and sports administration from Simpson College in Iowa, where he also played basketball and golf, earning a most valuable player distinction in golf. He obtained a master’s in education administration from North Dakota State University and is pursuing a Ph.D. in higher education administration from the University of Virginia. As Simpson University’s director of athletics, Galbraith will oversee staff members, coaches and 12 intercollegiate sports teams (men’s and women’s soccer, cross-country, golf, and basketball; women’s volleyball and softball; and men’s wrestling and baseball). Simpson University has dual membership in the NAIA (National Association of Intercollegiate Athletics) and the NCCAA (National Christian College Athletic Association). “Our student-athletes are the lifeblood of the department, and it is our job as administrators, coaches, and staff to give them every opportunity to be as successful as possible, both on and off the field of play,” Galbraith said. Galbraith and his wife, Janelle, have three daughters.